“Weddings are as unique as the bride and groom who plan them. The cake should be no exception,” says Sweet Tooth co-owner Brianna Pribek. Contrasting a soft marble background with gum-paste flowers and brooch-inspired metallic accents, Pribek created an on-trend cake that delivers an array of elegant details. The three most important elements are shape, size and color, declares the Cake Lady owner Cecelia Grade. 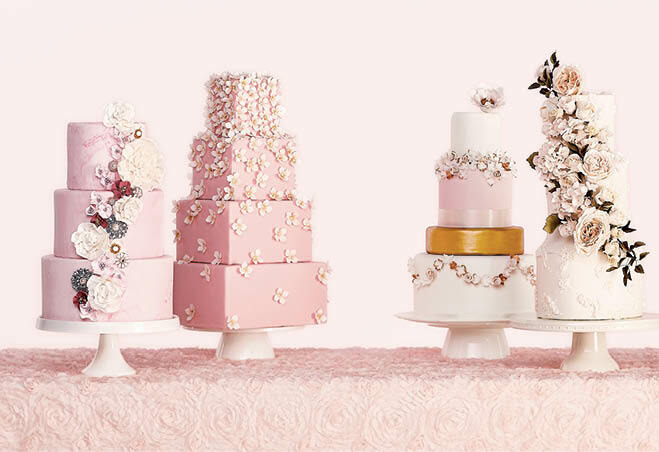 They’re perfectly balanced here, featuring varying dimensions, handmade scalloped sugar flowers, pops of metallics, and a charming pink and white palette.